Our network was, literally, built from the ground up specifically for fax server software users. We recognized that T.38-capable fax server owners/operators were desperately looking for a carrier who would offer reliable SIP service with T.38 enabled, and who would officially certify their SIP service as ‘fax-approved.’ We partnered with Dialogic, the makers of the industry-leading T.38 stack embedded in many of the most popular fax server software such as OpenText RightFax, GFI FaxMaker, and others, and we built a SIP service whose sole purpose was to connect SR140-based T.38 Fax Over IP calls. Since then we’ve also expanded our compatibility list to include most popular non-Dialogic fax server software products. I think you’ll find we have a very comprehensive view of the fax server software industry. We’d love to share that expertise with you, and help you understand how our service could be the solution to your fax challenges. If you’ve been doing fax as long as we have, you may remember a time when a ‘fax server’ meant a physical server, running fax server software, with a PCI fax card connecting the server to traditional copper phone lines. While it’s still possible to do fax that way, virtual or cloud-based server farms and SIP-based VoIP phone services have transformed the industry. These days, most new fax server software deployments run in some sort of virtual environment (VMWare, Hyper-V or Amazon AWS for instance), and they rely on SIP-based (VoIP) phone circuits for their PSTN connection. Unfortunately, SIP circuits are susceptible to latency, jitter and packet loss and thus notoriously bad at transmitting fax signals. The reasons for this are well understood, and the industry invented a technology called T.38 Fax Over IP (FoIP) years ago to solve that problem. Fax software manufacturers were quick to adopt T.38 — if you’ve deployed a fax server in the past 10 years, the chances are high that it has very solid T.38 support. 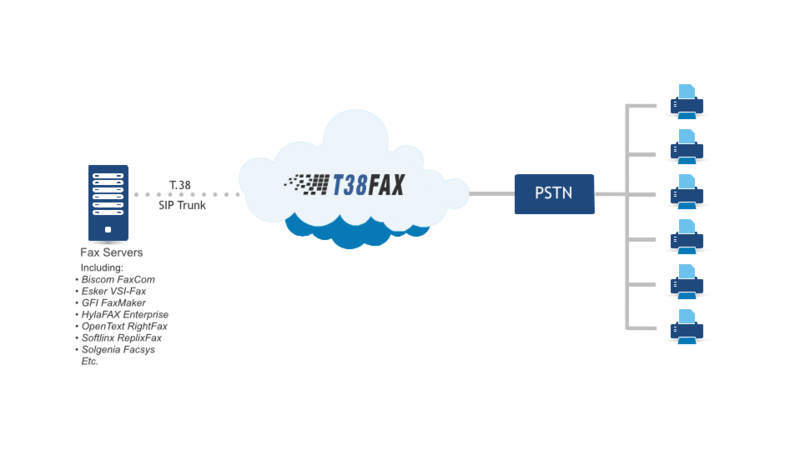 Unfortunately, many SIP service providers and IP-PBX vendors have been too distracted by their voice customers to pay much attention to fax, and their T.38 support is either pretty shaky, or downright nonexistent. In truth, companies who deploy fax servers on SIP connections have very few options when it comes time to select a phone company that is going to be able to support their fax calls. We didn’t set out to build our own SIP service. We searched extensively for a SIP-based carrier whose T.38-enabled SIP service we could re-sell, but when we stress-tested each finalist from our search the fax reliability fell well short of even our lowest expectations. After over a year of intensive interop testing with many of the leading names in the industry, it became clear that these companies did not have the fax expertise in-house to implement T.38 correctly in the first place, and they certainly didn’t have anyone on staff who could answer questions about fax calls. We were going to have to build it ourselves. We partnered with Dialogic, a dominant player and innovator in T.38 FoIP whose SR140 technology is embedded in many of the world’s most popular fax servers, and we built a network that worked extremely well with SR140. To do this, we needed to go back to basics, and completely disable any of the defective T.38 our upstream carriers might be trying to do. Then we built high-capacity, optical interconnections directly into the center of most of North America’s top phone carriers (Level3, XO, Windstream and others) and developed our very own T.38 stack that we deployed to media gateways on the edge of our core network. We made certain our T.38 supported the fax protocol’s vital Error Correction Mode (ECM) feature, and that it could reliably sustain faxes many hundreds of pages in length. We passed Dialogic’s interop testing with the highest level of success they have ever seen, and we began selling our service. From this strong foundation, we branched out and added official support for most T.38-capable fax server software products in today’s market, and we were off to the races. Of course these days we support most T.38-capable endpoints including ATAs, gateways as well as IP-PBX software such as Asterisk & FreeSwitch, but it’s important to remember that because we grew out of the fax server software industry, we’ll always be a strong contender for fax server deployments. So how does this all work? Well, in T.38 parlance your fax server is a T.38 endpoint, and we are the T.38 gateway. When you place an outgoing call from your fax server you send us a SIP INVITE, we accept that invite and connect the call to the number you’re dialing, and when the other side answers we immediately request the call switch from G.711 audio to T.38 UDPTL (we can do that because we don’t support voice calling). Once the two sides make that switch successfully, the fax data moving back and forth between us is no longer audio, it’s actually just pure data. The two fax machines think they’re talking directly to one another via a traditional audio call, but we are protecting the leg of the call between your fax server and our media gateways by converting it to data that carries the same page data information as the audio call would, but is unaffected by any audio challenges that might otherwise be present on the call. To receive a fax via our service, you would first need to transfer your telephone numbers to our service (a process called ‘porting’). When a call comes in to that number we send your fax server an INVITE, and you answer the call, invite the call to switch to T.38, and once again receive the fax page data using T.38 data, not G.711 audio. The first key to our success is that we don’t simply re-sell the broken T.38 support our upstream carriers offer us, but instead we have taken the time to build our own high quality, feature complete and broadly compatible T.38 Fax Over IP stack. Our customers interoperate with that single T.38 stack across all calls, no matter how the call is routed on our side, and we’re continuously improving our T.38 technology to handle all of the weird and wonderful situations our customers encounter on a day-to-day basis. Second, we realize that without ECM Error Correction you can’t be sure the image is identical on both sides … so you no longer truly have a facsimile. We make sure ECM is turned on in our equipment, and we’ll help help you confirm it’s enabled on your side as well. Finally, customers enjoy unlimited free support from highly trained, experienced fax industry professionals who bring a wealth of fax knowledge to the table. We don’t troubleshoot failed faxes as a failed voice call, we dig in deep and come out with the answer using science, not superstition.